Bonus #1: The 5-Part ‘Master Your Mindset' audio series including training on energy management, lean product development and the theory of constraints. 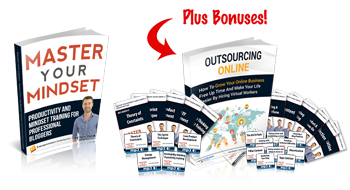 Bonus #2: Outsourcing Online – How to grow your online business, free up your time and make your life easier by hiring virtual workers. Bonus #3: The Classic 10 Part ‘Master The Mindset' audios featuring training on the 80/20 Rule, information overload, and establishing a vision.